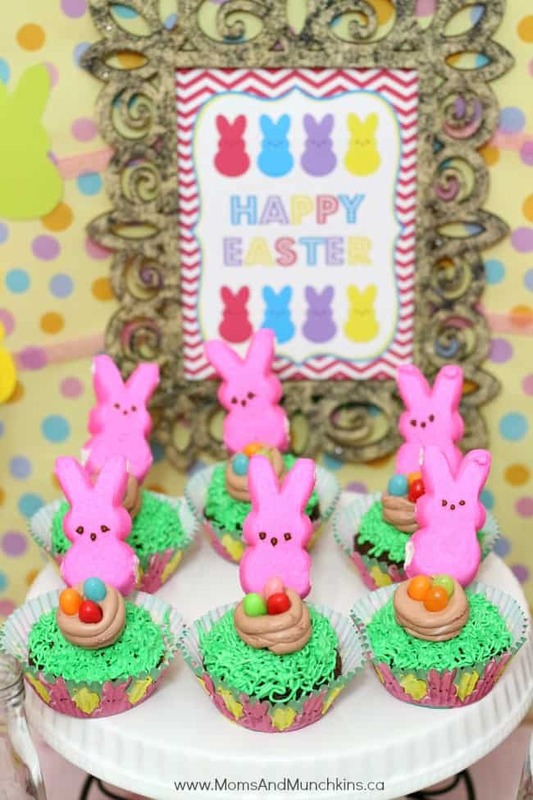 Easter Bunny cupcakes that are easy to make & fun to eat! To make these cupcakes, start with your favorite cupcake and icing recipes (or take the easy way – like me – with packaged mixes). Step One: Top the Easter Bunny cupcakes with green icing (I used an icing tip here that looks like a thimble so that I could create the look of grass). 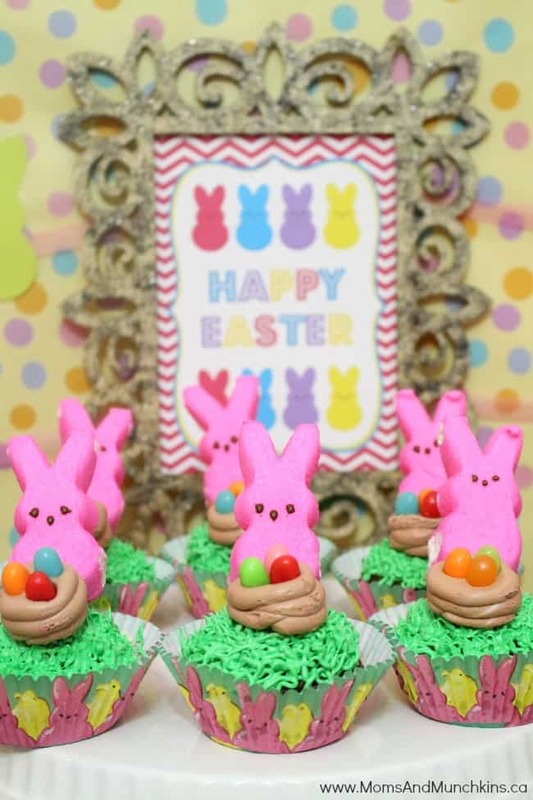 Step Two: Top the cupcake with a marshmallow PEEPS bunny (I put a toothpick between each bunny and the cupcake to hold them in place – make sure your guests know to take the toothpicks out!). Step Three: Use thick brown icing to pipe a frosting basket on top of each cupcake and fill with three mini jelly beans. I made my icing baskets ahead of time on wax paper, put them in the freezer for about 20 minutes and then transferred them on top of the cupcakes. Having them in the freezer for a while helped them to keep their shape on the cupcake. Looking for a delicious cupcake recipe? Try this recipe for brownie cupcakes – it’s one of my favorites! Really…how can you go wrong with a brownie and a cupcake all in one?! These are so easy to make and taste delicious! Preheat oven to 350 F. Lightly spray muffin tins or use paper liners (will make 18 cupcakes). Melt chocolate and butter together in microwave. Stir until mixed well. Stir in brown sugar until mixed well. Pour into muffin tins and bake for 25 minutes. Cool completely before icing & decorating. As a special surprise cupcake treat, I add one chocolate caramel cup to each cupcake when they first come out of the oven. Just push the caramel cup down into the middle of the cupcake until the top of the caramel cup is even with the top of the cupcake. Let these cool in the muffin tin before removing to cool on the rack (so that they continue to hold their shape after removing placing the caramel cup in them). The caramel cup adds to the awesome deliciousness of these Easter Bunny cupcakes! 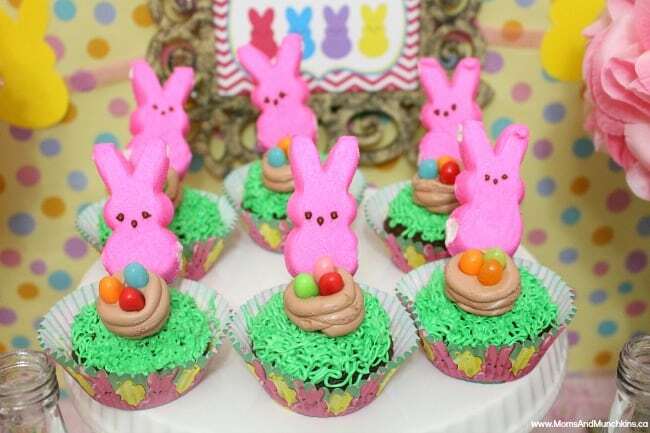 We also have an Easter Pinterest board full of fun ideas. To stay updated on the latest ideas for family fun, follow along on Facebook, Twitter, Pinterest and Bloglovin’. Ohhh…they look so cute! I love how easy they are to put together and your idea of adding the caramel to the cupcake while it is warm.